What are some of the possible problems with the interpretation provided by Irwin Panofsky? What is Panofsky’s interpretion and how might it be discredited? 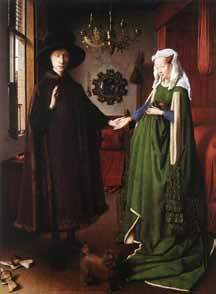 This is Arnolfini Wedding by Jan Van Eyck located in Flanders, Belgium and this made in 1434. This painting is an Italian couple getting married. It's made in tempera oil pain. The couple are making a vow for their wedding with a candle to represent enlightenment. The wife is by the bed and she looks as if she is pregnant. They are bare feet on the Persian carpet that represent wealth. Their dog represents royalty. In the background, there is a mirror and the artist's signature and date of the drawing. The problem about the painting is that it was painting 13 years before the wedding happened and 6 years after the artist died.